Sapporo, a city that has a distinctive history from its pioneering period, had formed a modern cityscape derived from its rich past. It is now the biggest city north of the Kanto region that blends rich nature, distinct seasons and advanced urban functions. These elements attract many domestic and international tourists, making Sapporo a leading tourist city that attracts more than 13 million tourists a year. This year, the grand opening of Moerenuma Park, the last work of the world-renowned sculptor, Isamu Noguchi, will take place in Sapporo. Taking this opportunity, Sapporo city is trying to create a new image of the city centering on 'ART' integrated with the magnificent natural beauty of Hokkaido. Moerenuma Park is located in the northeastern part of Sapporo, where a unique project built a park on land used as a waste disposal site. The project began in 1979 and the total of 2.7 million tons of waste was collected and used as landfill until the site closed in 1990. Isamu Noguchi first visited Sapporo in March 1988, and showed a strong interest in the project. The city of Sapporo commissioned Noguchi to design the park; however, Noguchi died soon after completing only the master plan of the park. The Isamu Noguchi Foundation and the city of Sapporo cherished the desire and will of Noguchi and continued with the project. This whole 189-hectare parkland is regarded as a sculptural work of Isamu Noguchi. This press tour to Sapporo will give you an opportunity to attend commemorative events for the grand opening of Moerenuma Park, and also to visit Sapporo Art Park featuring a special exhibition on Isamu Noguchi. In addition, you will have a chance to see the Black Slide Mantra, a work by Isamu Noguchi which is set in Odori Park in the heart of the city. On this tour, you will sense and feel the art that integrates Sapporo's nature and cityscape, and feel for yourself the unique atmosphere and attractiveness of a city which is unlike any other in Asia. 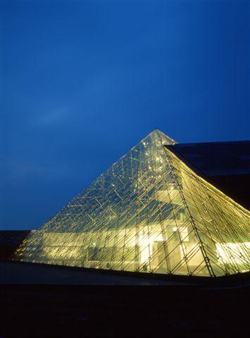 A talk on the park will be given by a curator at the Glass Pyramid, the park's major facility. After this, you will have a chance to see around the park and its major facilities before the start of the ceremony. Mr. Shoji Sadao, director of The Isamu Noguchi Foundation, who supervised the park's planning after Isamu Noguchi's death, will present a Certificate of Recognition to Mr. Fumio Ueda, Sapporo city mayor. A reception will be held afterwards, with the participation of all who were involved in the planning and building of the park. Reflecting Sapporo's new image, the students of Sapporo Junior Jazz School will perform big band music. These junior-high school students were selected in auditions held by Sapporo Art Park. The tour participants will have a chance to see the inauguration of 'Sea Fountain,' the highlight of this grand opening ceremony. 'Sea Fountain' is a water sculpture that depicts Isamu Noguchi's image of universe, earth and nature. The local children will turn on the button to start the flow of water, followed by a 40-minute program. This fountain will light up at night to create a fantastic atmosphere. After the program, there will be an art performance 'Grand', produced by Sapporo-based contemporary artist Satoshi Hata. This show is art expression by Vaclav Kunes, principal of the Netherlands Dance Theater and Japanese dancers, performed with projected lights and screen images. Other performances will follow in front of a water screen at the beach inside the park. Photos (from the top) by Sapporo City, Moere Fan Club, and Mr. Hiroo Namiki. Commemorating the grand opening of Moerenuma Park, the Isamu Noguchi Exhibition will be held in Sapporo Art Park. You will have a chance to cover 45 works and other materials including those coming from Garden Museum of Isamu Noguchi Foundation in New York. A curator will show you around Sculpture Garden, where 74 works by domestic and foreign sculptors are exhibited in a spacious garden with white birches. 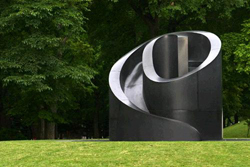 Black Slide Mantra, another work by Noguchi, stands in Odori Park, which stretches for 1.5 km through central Sapporo. You will enjoy the city's artistic atmosphere by visiting the sculpture and other works and monuments in Odori Park (which in winter is the venue of the Snow Festival). Born in 1904 in Los Angeles to Japanese poet Yonejiro Noguchi and Leonie Gilmour, American writer. Spent his early days in Japan. After returning to the United States, and wishing to become a sculptor, Noguchi traveled in Asia and Europe. In Paris, he worked as an assistant to Brancusi, the well-known sculptor. Starting with portrait sculptures and stage art, he expanded his professional fields to environmental sculptures and landscape design. After the war, he was also active in Japan producing ceramic works and Akari lanterns using Japanese paper, the friend of such avant-garde artists of that time as Kenzo Tange, Gennichiro Inokuma, Sofu Teshigahara, Rosanjin Kitaoji, and Taro Okamoto. 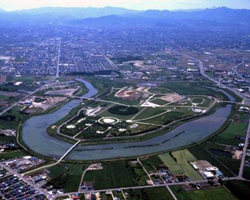 In March 1988 Noguchi visited Sapporo and created the master plan of Moerenuma Park in November the same year. He died in New York in the following month. 4. Participants: Limited to the first 20 applicants on a first-come first-served basis. (Only one reporter and one photographer from each company, but two participants in each TV team will be acceptable.) If the number of applicants exceeds 20, an upper limit may be set on the number of participants from each country.